The most familiar symbols for British English were chosen by A. C. Gimson over half a century ago as an ‘explicit’, ‘realistic’ description of the upper class pronunciation of that time, ‘Received Pronunciation’. Since then, there have been changes in society and speech, especially vowels. For contemporary SSB (Standard Southern British), Gimson’s symbols are now less realistic: pronouncing them with their true IPA values sounds old-fashioned, even amusing, to native speakers. The Gimsonian symbols are also phonologically misleading, suggesting an odd subgrouping of the long vowels and diphthongs. 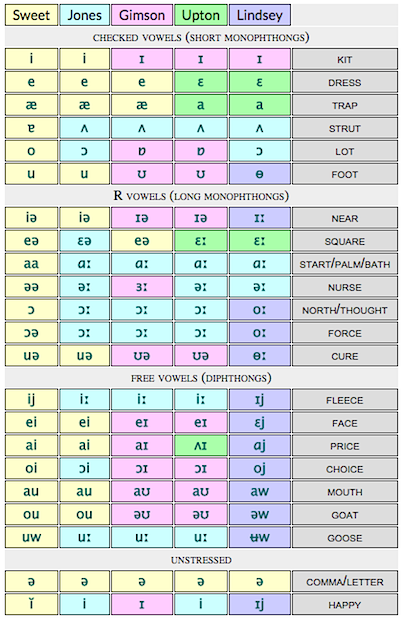 In the following chart from my English After RP, I use IPA symbols to represent contemporary vowels in way that attempts to be phonetically and phonologically more realistic. Also shown, in faint grey, are the more traditional Gimsonian symbols where these differ. 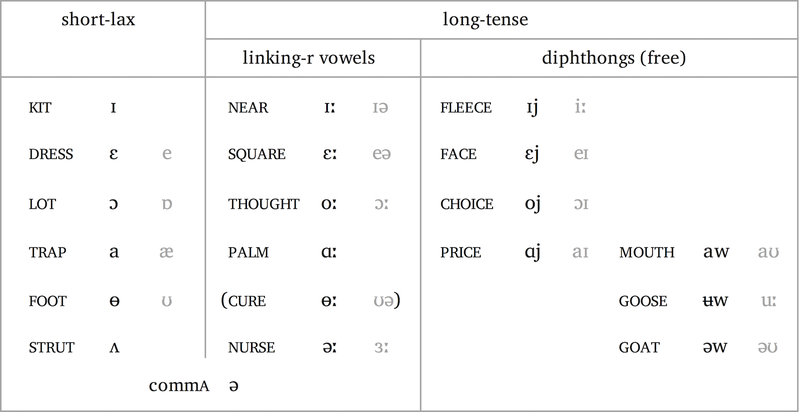 diphthongs (free): may occur before consonants or vowels, eg lie, like, lion, and never trigger linking r. These diphthongs are also particularly susceptible to various processes: smoothing, pre-fortis clipping, and pre-l breaking. 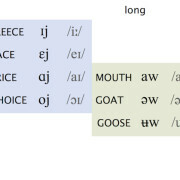 The NEAR vowel is highly variable, and the PURE vowel is increasingly replaced with the NORTH vowel. Altogether there are 18 to 20 vowels, depending on whether we retain a distinct PURE vowel, and also on whether or not we treat commA and STRUT as distinct or as stressed-determined variants. I discuss the whole SSB vowel system at length, with audio illustrations, in this article. I’ve also written the following individual blog posts on the vowels of commA and STRUT, LOT and NORTH, FOOT, FLEECE, NEAR, SQUARE and PURE. And all the SSB vowels and vowel categories are covered in English After RP.